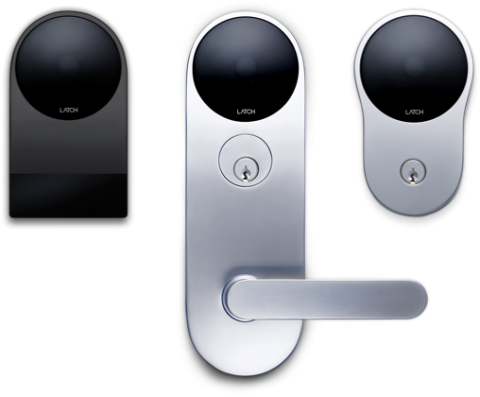 The Latch family of smart access system locks and readers. New products come our way pretty frequently but this is one that we find very intriguing. Latch is part of a new generation of electronic access control products providing keyless access and centralized management to multi-family projects. For the property manager or building owner, Latch allows you to quickly grant or deny access to residents and guests. A complete audit trail is kept of access including pictures or who is entering and all management is via an easy-to-use, familiar web-based console. Your residents will love the convenience too. No need for keys with this system. Seamless access using a smartphone, keycard or special door code get them in the door. They too can temporarily grant access to guests as well. And, for those that still want to use a traditional key, that is an option as well. A system by Latch could very well be a perfect fit for your multi-family project. If you are interested, reach out to Doorways’ Security Integration specialists for more information.